"MOM AND DAD, CAN I GET A CAT?" ASKED AVA. "PRETTY, PRETTY PLEASE?" "CATS SHED!" SAID DAD, LOOKING DOUBTFUL. "CATS MUST BE REGULARLY FED!" SAID MOM. "MAYBE WHEN YOU ARE OLDER." That's not what any pet-seeking kid wants to hear. And besides, Ava knows she can handle cat care capably. Then opportunity calls, when Ava hears a plaintive mew near her in the park. IT WAS A FURRY, PURRY, SNUGGLY, CUDDLY CUTIE PATOOTIE. What's a kid to do when faced with with a teeny-tiny itty bitty kitty who needs a home? What else? Ava smuggles the snuggly little kitty into the house and keeps it hidden from Mom and Dad, certain that she can take care of the kitty, and when Mom or Dad discovers her new pet, they will realize that she is plenty mature enough to take care of such a small critter. There's just one problem that makes itself evident in a few days. No, it's not hiding that tell-tale litterbox smell. AFTER ONLY ONE WEEK, HE WAS NO LONGER ACTUALLY ITTY BITTY! Things get a bit testy around the house when Ava is found to be harboring a really BIG CAT! Will Ava get to keep her snuggle buddy? Luckily, fate steps in when her heavy-duty feline turns out to be a hero when Ava's baby brother takes a tumble in the dead of night, and it's ITTY Bitty to the rescue! 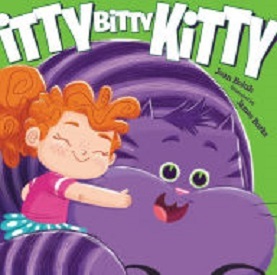 It's a PURRFECT ending, in Joan Holub's latest Itty Bitty Kitty (Harper, 2015). While most would-be pet owners aren't lucky enough to have their prospective pet turn out to be a hero, a kid can always hope, can't she? Author Joan Holub's jolly rhyming and artist James Burke's extravagant illustrations give this hopeful wish-fulfillment fancy a lot of fun for furry pet lovers.